Enidina Current and Mary Morrow live on neighboring farms in the flat, hard country of the upper Midwest during the early 1900s. This hardscrabble life comes easily to some, like Eddie, who has never wanted more than the land she works and the animals she raises on it with her husband, Frank. But for the deeply religious Mary, farming is an awkward living and at odds with her more cosmopolitan inclinations. Still, Mary creates a clean and orderly home life for her stormy husband, Jack, and her sons, while she adapts to the isolation of a rural town through the inspiration of a local preacher. She is the first to befriend Eddie in a relationship that will prove as rugged as the ground they walk on. Despite having little in common, Eddie and Mary need one another for survival and companionship. 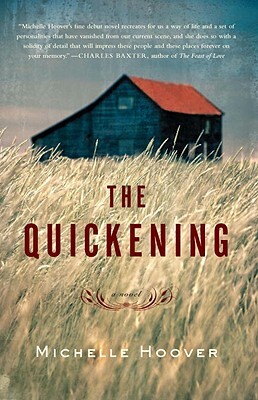 But as the Great Depression threatens, the delicate balance of their reliance on one another tips, pitting neighbor against neighbor, exposing the dark secrets they hide from one another, and triggering a series of disquieting events that threaten to unravel not only their friendship but their families as well. For information, tour dates, and reading group resources, visit www.michellehoover.net. has published fiction in Confrontation, The Massachusetts Review, Prairie Schooner, and Best New American Voices, among others. She has been a Bread Loaf Writer’s Conference scholar, the Philip Roth Writer-in-Residence at Bucknell University, a MacDowell fellow, a Pushcart Prize nominee, and in 2005 the winner of the PEN/New England Discovery Award for Fiction. She was born in Ames, Iowa, the granddaughter of four longtime farming families. Discuss the ways the author uses landscape as a character in The Quickening. The tension between Enidina and Mary slowly builds from a personality conflict until it becomes an enduring family feud. In what ways does this evolve from a difference in values? In what ways is it shaped by external forces? As a reader, did you find yourself “taking sides”? Why? Did your allegiances change over the course of the book? How does the novel explore the uneasy relationship between money and morality? In dire financial times, how do the Currents balance the needs of their family and farm, and what they believe is right? What about the Morrows? How are these themes and dilemmas relevant to our own time? Compare Enidina and Frank’s marriage to Jack and Mary’s. How does their love change over the course of the novel? In each relationship, how do circumstances bring them together? How do they drive them apart? One of the driving forces and major themes of The Quickening is betrayal. How does betrayal—real or perceived—shape the relationships between various characters? In which cases do you think the character is right to feel wronged? In which cases do you disagree? Do you think that Enidina and Mary’s friendship is entirely one of necessity? After all, the Currents managed fine before the Morrows moved in down the road. If it is, then what kind of necessity? Practical, emotional, financial, familial? How does this change over the course of the novel? How are the children—especially Kyle and Adaline—shaped by the relationship between their mother and father? Between their two families? How does Mary’s religious devotion affect her sense of righteousness? Do you believe that she genuinely tries to do the right thing? Or does she, more often, try to convince herself that she has done the right thing? What do you think the novel says about the possibility and nature of forgiveness? Is redemption possible? Do the characters find it?